After 24 days of getting engaged, I finally get to slip on the ring perfectly. I got them resized about a week or so after the engagement. And after the engagement I only kept it in the box. Honestly, I never wanted a one diamond ring (cincin batu satu)... I thought it as old fashioned and awkward with just one diamond stuck in the middle. And at first I thought there isn't any difference between Zircon and pure diamond (my fiancè said so) but I guess a girl is a girl; once showed the pure diamond, I can immediately tell the difference. And so I decided I wanted diamond. I've actually always imagined a ring with a flower-like diamond in the middle. Not one big stump of diamond in the middle. But... But... When I set my eyes on this one I just have to have it. My heart says this.is.the.one. Luckily it was on sale 50%. That's a whole lot of discount, really. So you get to choose those expensive ones with a cheaper price without compromising on quality. 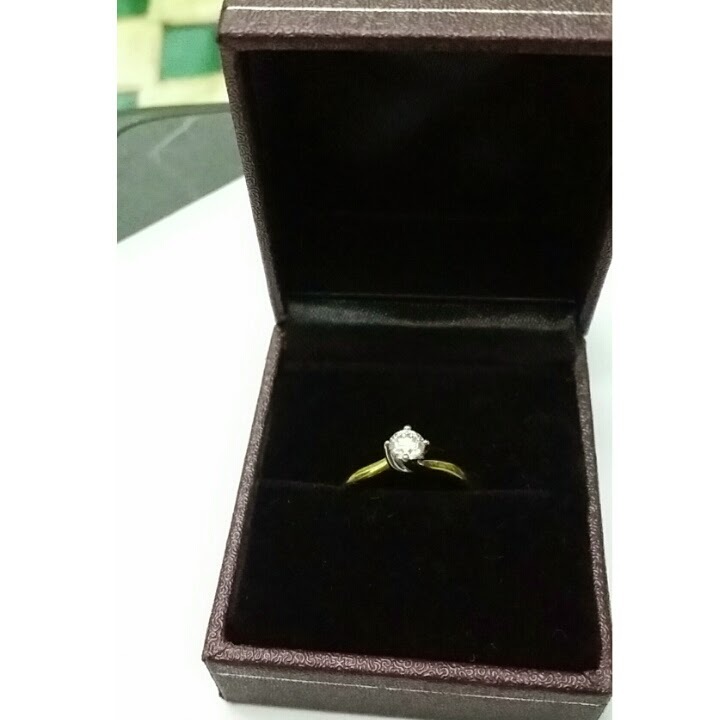 After asking many times and rechecking again is this the one is this the one, he finally bought the ring. I still asked whether it is possible to make any changes. Haha.. But really, deep in my heart I believe this is the one. And the one is the one because it's within his budget 'after discount'. HAHA! Oh I'm also thankful to have met such a patient person... Booked a ring, then cancel. Find another ring. Then another ring.... Even me myself got tired of my own fussy self sometimes. I didn't know Habib is an expensive brand until I got this ring. I thought all jewellery shop are the same. Yea, seriously. I wasn't into jewelleries that much. Well, before I got engaged. Now I just love 'em to bits.